Dry eye syndrome is typically a progressive condition. Depending on its cause and severity, it has different mode of treatment. Dry eyes may not be completely cured but can be managed successfully with appropriate treatment and patient compliance. 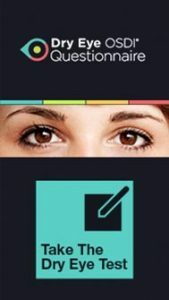 Dry eye can make it more difficult to perform some activities, such as using a computer, reading and even watching television for an extended period of time. It can also decrease tolerance for dry and windy environment. Test yourself to know if you have dry eyes. Answer this form, print and bring with you when you see us. A very significant percentage of dry eye cases are caused by inadequate oil being secreted from meibomian glands located along the margin of the eyelids. To treat MGD and evaporative dry eye, our optometrist may perform an in-office procedure called meibomian gland expression. 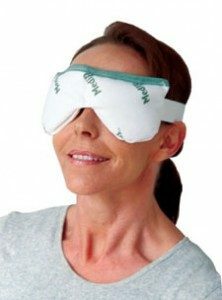 Before we do expressions, we heat the eyelid margin with the use of a warming device called Blephasteam®. After warming the lids for 10-15 minutes, you will be asked to sit in front of the slitlamp. The warm compress will melt the oil and now is ready to be expressed. The result of this in-office regimen relieves patients with MGD. The problem in using just a towel for warm compresses is that you have to constantly soak it in water to regain the warmth. Using this crude way is not as effective as a certain temperature has to be reached to melt the oil clogging the meibomian glands. Scleral lenses are also used to manage ocular surface disease such as dry eyes. 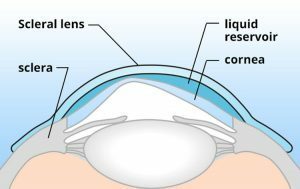 Because the scleral lens bowl is filled with liquid, this allows the cornea to be immersed in moisture all day. It can help dry eye patients to feel relief and thus function better. Relieve dry eyes syndrome naturally with Ziena Moisture Chamber Glasses. 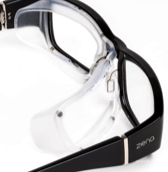 Ziena’s silicone shield locks in eye moisture while blocking out wind & airborne irritants like dust & pollen. 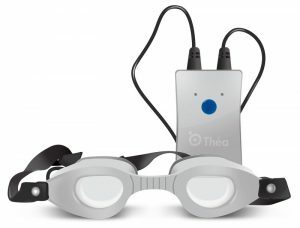 It is specifically designed to alleviate symptoms of dry eyes, hay fever, and bell’s palsy. It is proven as a noninvasive (no surgery, natural) solution to ailments. Ziena eyewear helps relieve the burning, itching and redness caused by dry eye, without side effects or reactions with other medications or treatments.